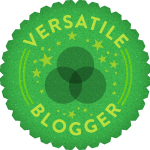 Ivy Book Bindings: Versatile Blogger Award! 7 Random Facts about Myself! 1. Chocolate Chip Cookie Dough is my favorite ice cream flavor. 2. I wear purple glasses (they don't look as weird as they sound). 3. I cried the most over the death's of Sirius Black and Severus Snape while reading the Harry Potter Series. 4. If I could meet any historical figure (dead or alive) I'd meet Abraham Lincoln. 5. I am a singer. 6. I don't play any sports but I love to watch tennis, cricket, soccer (or football), and Olympic Swimming, Track, and Gymnastics. Thanks for nominating me for this award! You're welcome! (: Thanks for stopping by my blog!